Astrologia, is a greek word that refers to the study of stars. The earliest document available in our western libraries is believed to be from 668-626 BC and it referenced things like: astronomic observations, eclipses, and predictions. The oldest known surviving horoscope ( a chart cast for a human being as opposed to a chart for a city/state/organization) is believed to be from 410 BC. The largest collection of astrological writings and manuscripts are held in the Vatican. A daily dose of doodling…..
On Jan 2, 2014 I set into motion my new year’s resolution to “draw something” everyday. That same afternoon, I sat with my 6-year old granddaughter and together we drew pictures, or doodles, or whatever we wanted to do. I explained to her that I was going to draw a picture in this ‘book’ everyday. Recently when we visited in June, she asked to see my ‘book’ and was delighted to see I had continued what we had started together. In looking thru my sketchbook it’s stunning to see what happened from late May thru June! You don’t need to be an art therapist to see that something interrupted my ‘usual’ flow. The underlying intention for me with this practice was to let go of any ideas of good drawing, bad drawing, and just try to let something come through that wasn’t………………………words. You see, I don’t draw. I write. I play music. I have other creative talents, but I have never really focused on drawing/painting etc. Except maybe when I had to take a couple of architectural drafting classes in college. I loved that kind of drawing. The ruler, the compass, the straight edge, and all those wonderfully sharp pencils & fine point pens, all were tools of delight. 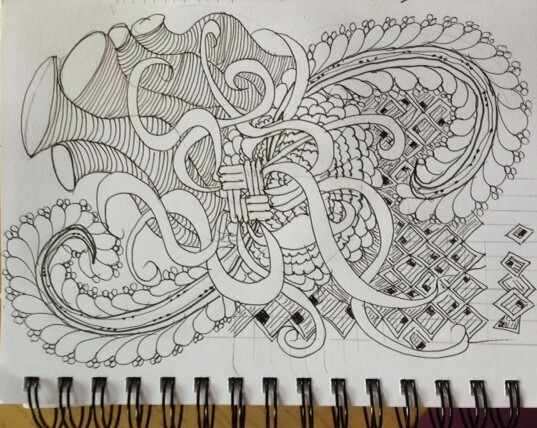 I’m carefully watching my process and my progress with rapt attention I continue to practice what I surprisingly learned during May, 2014, and that is a ‘new’ found drawing/meditation technique known as Zentangling. ( I thought I was onto something ‘new’ myself, having come to the website quite by accident.) Anyway, I’m onto my second sketchbook, in record time, and recommitting to my new years resolution of a drawing a day, or as it’s looking right now, ” A Doodle A Day” ! One of life’s synchronicities showed up when I recently opened Kripalu’s Fall catalogue. Right there in the first few pages on the upper right corner was an ad for the upcoming weekend with the founders of Zentangle at Kripalu! Life gets tangled up, you know and there’s more to this story than I care to write about right now. But, it is revealing and interesting to look back at all the pictures since January and see the (artistic) representations that have developed. It’s easy to see. It’s visual. Hi Everyone. Th is is my first post on this newly-designed website. I don’t have much time to write right now. I hope to get back here later today to discuss a few things. Meanwhile, click around, and let me know, please, what needs some editing/tweaking etc. I will turn the comments on for this post. I don’t think the link to subscribe by email is working yet. Need to figure that out. ……..to those of you who have recently attended my lectures. It is exciting to see so many new and familiar faces. The topic of feng shui, as we came to understand it recently, is much more rich and fascinating then just figuring out what to do with the old couch! Stay tuned for more and remember to visit my website for upcoming events. May your life be lived in harmony and good fortune. The content for this upcoming site is currently being compiled. Be patient and check back. Please leave a comment and let me know what kind of information you are seeking? Need a space to offer your workshop, class, or training? Please contact: Ida if you are looking for a quiet, empty space. and the inside of the card reads: “Let me rephrase that”. When we make self-inquiry part of our daily spiritual practice we allow ourselves the bliss of integration. Do you like to do jig-saw puzzles? There a lot of high’s and low’s show up with that particular past-time. The Missing Piece, Turning the Corner, Completing the Frame, ……….and then the Moment of Completion! Or, maybe, The Agony of Despair because completion is impossible. Life is like that. Every day a new piece, a new set of colors, shapes, and sizes to breathe with. Perspective is the key and not until we have done some serious self-inquiry can we hope to regain balance and harmony in our life. There are times during the course of a month/year/life that are really optimum for self-inquiry practices. Go to this post on one of my other blogs for more on self-inquiry.